A Beast Man Digimon that has gained astounding jumping ability, and uses its swift movements to toy with its enemies. Although its personality is as wavering as the phases of the moon, its appearance exudes a somewhat mystical air. Its Special Moves are creating hypnotic water bubbles from the "Moon Gloves" worn on its hands, and throwing them to lull the enemy to sleep (Moon Night Bomb), as well as pulling beautiful arrows of ice from the protrusions on its back and firing them (Tear Arrow). 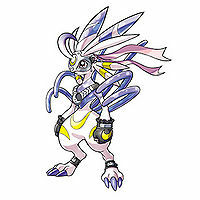 It also displays great strength with its Moon Night Kick, where it leaps high into the air and performs a diving kick. 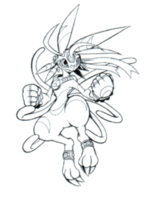 A Beast Man Digimon that has gained astounding jumping ability, and uses its swift movements to toy with its enemies. Although its personality is as wavering as the phases of the moon, its appearance exudes a somewhat mystical air. Lekis is a corruption of the transliteration of rex, a breed of rabbit . Moon Night Kick  ムーンナイトキック Mūn Naito Kikku Jumps into the air and attacks with a powerful downward kick. Tear Arrow  ティアーアロー Tiā Arō Pulls arrows of ice from the protrusions on its back and throws them at the enemy. Moon Night Bomb  ムーンナイトボム Mūn Naito Bomu Throws a hypnotic water bubble from its Moon Glove, putting the enemy to sleep. 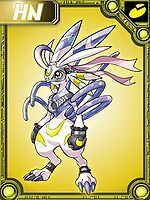 Lekismon is #193 in Digimon Story: Sunburst and Moonlight Digimon Gallery, and is a Balance-class Dark-species Digimon with a resistance to the Dark element and weakness to the Light element. Its basic stats are 152 HP, 194 MP, 93 Attack, 84 Defense, 94 Spirit, 89 Speed, and 45 Aptitude. It possesses the Speed 3 and Quick 2 traits. Lekismon evolves from Lunamon and can evolve to Crescemon. 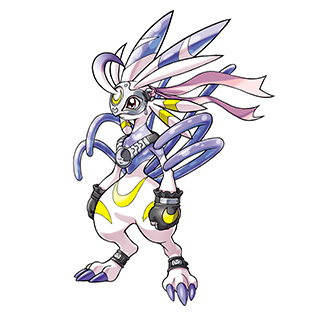 In order to become Lekismon, your Digimon must be at least level 19, with 70% friendship. 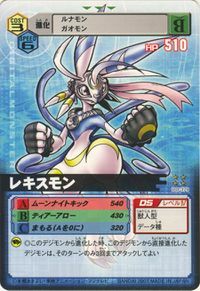 Lekismon can Jogress with Devidramon or Cockatrimon to form Lady Devimon. Lekismon evolves from Lunamon after 5 battles and evolves to Crescemon after 10 battles. 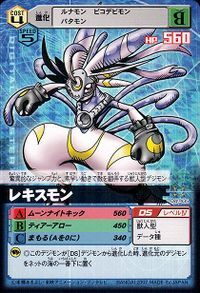 Lekismon is only obtainable as a collectible card. Its card is part of the Moonlight God of Olympos (オリンポスの月光神 Orinposu no Gekkō Shin) set. 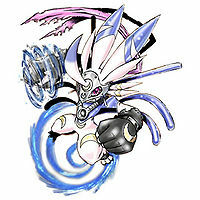 Lekismon is available as a Digimon Medal. 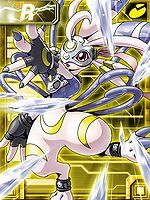 Lekismon is available as a Digimon Card. 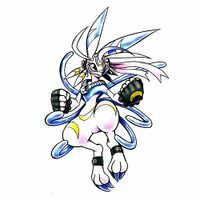 This beast man type digimon trifles with her enemies with her nimble movement and wonderful jumping power. This page was last modified on 5 April 2019, at 17:20.